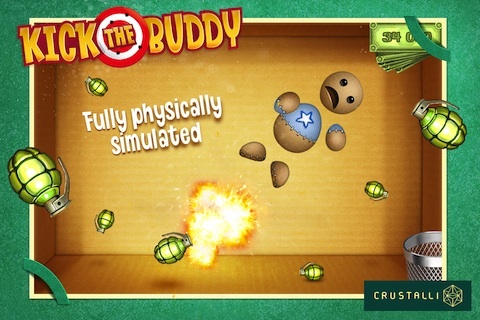 Kick the Buddy, by AppZap, is a rather funny iPhone app that serves as a great stress reliever while also being horribly cruel in the most awesome way. The basic objective of the game is to confront your adorable, well-mannered buddy and inflict as much physical pain as possible in the most creative ways. Whether it be by freezing him and then blowing him up with a rocket launcher, or simply using a taser on him while he’s cooking in a toaster. There’s no wrong way to mistreat this cute little beat-em-up doll. This application, which can be used on the iPhone, the iPod touch, or on an iPad, presents itself as a great time-passer while you’re standing in line at the store or if you’re simply bored in class. You can just open it up and start beating up your poor, defenseless friend. One thing that truly adds to the great humor of the game is that you can actually take a friend’s face from any picture on your phone, and put it on the doll itself. No longer do you have to dream about what it would be like to stuff your friends into a giant toaster, because now you have a helpful iPhone app to help you out! The audio is rather minimal and doesn’t really take anything away from the enjoyment of it all, which is something that I can really admire in an app. It’s nothing special and I do wish that the doll would possibly speak out loud, but perhaps that’ll be added in future installments. There’s also a great amount to keep playing for in the beginning, as the more you beat up your friend, the more money you earn. And that money, in turn, helps you buy more interesting weapons to help load up your arsenal. The graphics are adorable and completely serve their purpose. Everything runs pretty smoothly and the entire thing is a bit like a cartoon, which really just adds to the entire feel of the app. The cartoon-like graphics also help keep the app fun without making it creepy or ultra-violent, which would be a definite concern if it looked anymore realistic. The app itself is only $.99 which is not bad at all, especially considering the fact that they have a free version for you to try in order to get a feel for it. Though I would suggest buying the actual app, as the free version does not have the ability to place your friend’s face on the doll, nor does it have any of the mini-games from the actual app. Overall, I think Kick the Buddy is a pretty fun iOS game in short periods of play time. 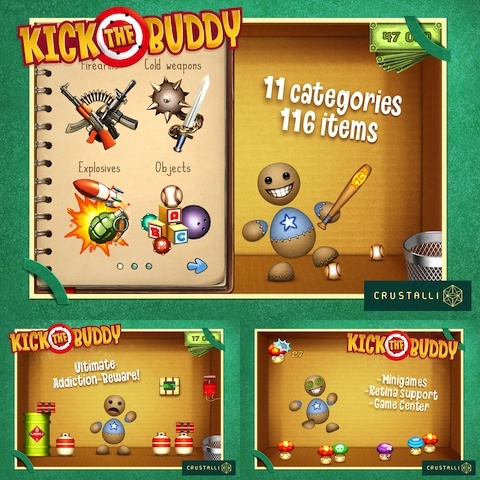 AppSafari review of Kick the Buddy was written by Ryan C. Robert on December 21st, 2011 and categorized under App Store, Arcade, Fun, Games. Page viewed 7982 times, 2 so far today. Need help on using these apps? Please read the Help Page.